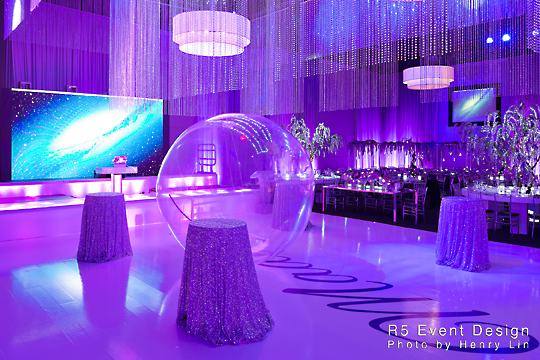 We are so incredible flattered and proud to have won a Canadian Special Events Award, alongside R5 Event Management and Design, for Whimsical World of Avatar, Madelyn’s Bat Mitzvah! The award was for best event décor under $30,000 and we could not be more honoured! Madelyn’s Bat Mitzvah was an absolutely outstanding event! The theme and the décor elements were unique and one of a kind and the Avatar meets Midsummer Night’s Dream theme perfectly aligned with Madelyn’s spunky, colourful and creative personality. 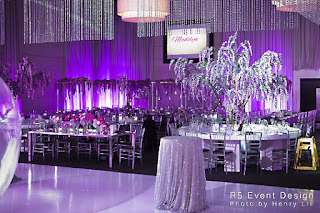 One of the most awe-inspiring décor aspect was the 35ft x 20ft two-tier crystal chandelier that we hung over top of the dance floor. The chandelier was filled with Twinkling LED Lights for that starry night effect. Guests truly felt like they were outside, dancing under a starry night, in a mystical environment, surrounded by glowing lights. The reception room had a plethora of different sized and shaped tables, giving the space a very whimsical layout. 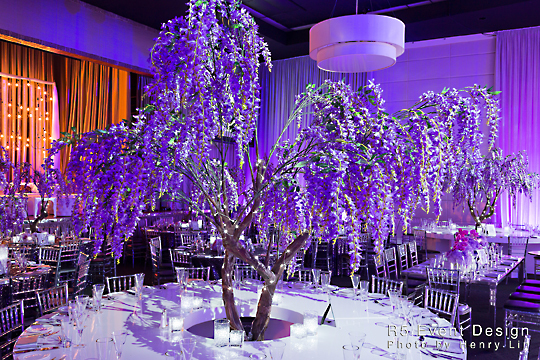 Each large round table had a custom designed 12ft purple Wisteria tree coming out of the centre. The tree branches and leaves draped over the entire table, creating an intimate, yet whimsical environment for guests during dinner. In between the four oversized tables stood two 8ft mirrored tables. Each mirrored table was filled with low floral centerpieces in different heights. Purple phalaenopsis orchids were cascading to create a floral wave affect on each table. Fairy Berries were also placed throughout the florals to continue with the whimsical Avatar theme. 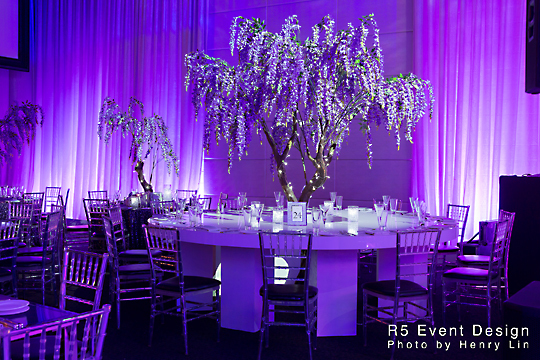 Finally, the kids’ tables were lined with a rectangle structure with cascading florals, similar to the trees, and floating LED Fairy Berries. 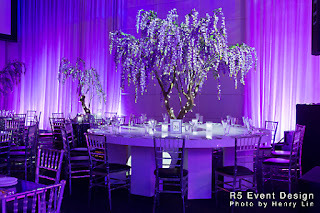 The remaining guest tables were 5’ft Purple Wisteria trees placed on round tables with a low floral arrangement and LED Fairy Berries. 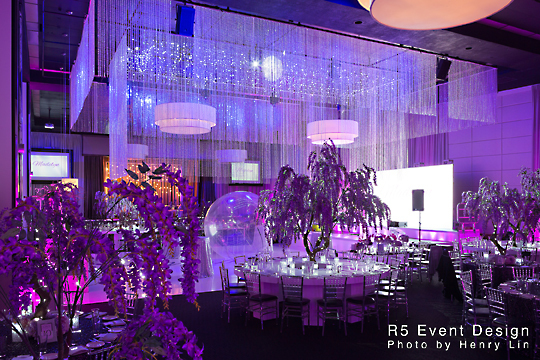 Each tree also had LED string lights, further enhancing the whimsical fantasy effect throughout the entire space. On the night of, all of the guests were completely wowed and felt like they were taken to a magical and mystical place. Most importantly, the Bat Mitzvah girl, Madelyn, was blown away by the décor and loved every part of the evening.